David Gulpilil is one of Australia’s leading Aboriginal actors. 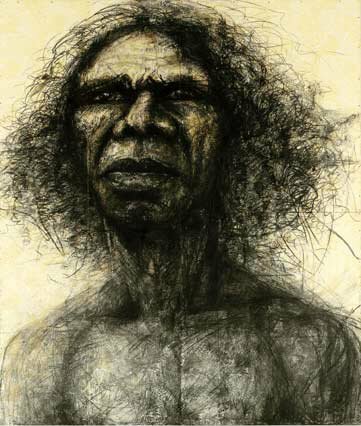 Born in Arnhem Land in 1953, he grew up as a member of the Mandalpingu tribe in the area his ancestors have inhabited for thousands of years. When he was 16 he was cast in the landmark Australian film Walkabout . Gulpilil has since achieved international fame in movies such as The last wave , Storm boy , Crocodile Dundee , Rabbit proof fence and The tracker . Between films he returns to Arnhem Land and his traditional lifestyle. His solo show Gulpilil , about his extraordinary life, premiered at the 2004 Adelaide Festival to rave reviews and will come to Belvoir Street Theatre in Sydney in October. Ruddy has been contemplating painting such a portrait for some time. ‘The bold, free-spirited line work of the charcoal and graphite contrast with the structured and refined opulence of the colonial English wallpaper. I hope that the work represents the energy and spirituality that I experienced in his presence.’ The wallpaper included as the background for this painting is the same as that used in the drawing room at Kirribilli House. Ruddy has focused seriously on painting full time for the past three years. He had solo exhibitions at the Sydney Fringe Festival in 2002 and at Graphis Gallery in 2003. He has also taken part in several group shows at Dank Street Studio. This is the first time he has been hung in the Archibald Prize, though he had a self-portrait in last year’s Salon des Refusés.